An avid atmospheric optics photographer, Pitan Singhasaneh has recently started experimenting with time lapse halo photography. Even though the displays are not special, the cloud movement and changes in halos create its own kind of magic. Pitan's videos are available at his Time-lapsed Photogaphy site ( 1 ). 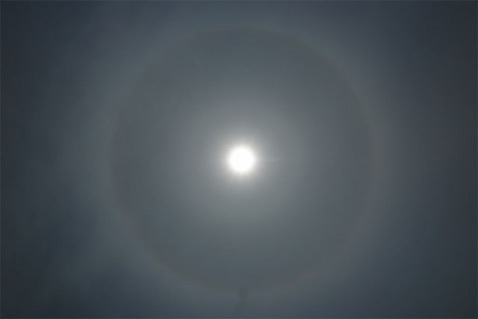 The photo above is from one of these displays, showing a 9° halo. If you like to see how halos in general look in the tropical climate of Thailand, see Pitan's photos from 2008 and 2009 ( 2 - 3 ). Sounds like what I had in Philippines Siquijor island. Got 50 days of halos in a row, plus moon halos. You could probably reach the same, and even more. Of course, I was not working then, just vacationing. The web server is back to normal again, thanks god.